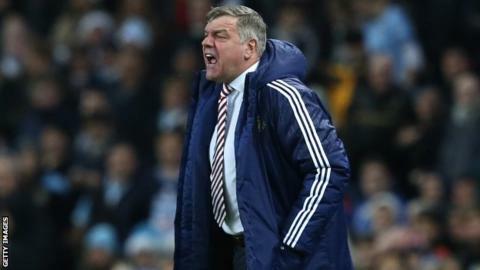 Sunderland will look overseas for signings as they look to strengthen their defence in the January transfer window, says manager Sam Allardyce. The Black Cats have conceded 37 goals in 18 Premier League games this season - more than any other team - and are second from bottom in the table. "I don't think they'd want to let anybody go." Sunderland have won three of their 10 games since Allardyce was appointed in October and are five points from safety as they prepare for Wednesday's home game against Liverpool. The former West Ham boss added: "We've got to get back to being a resilient defensive unit but the backline and the goalkeeper have to be the ones that ultimately secure those clean sheets, so a central defender is my first priority. "For me, it looks like it might be from abroad, and then see where we go from there. "Whether we can find one good enough is another matter."